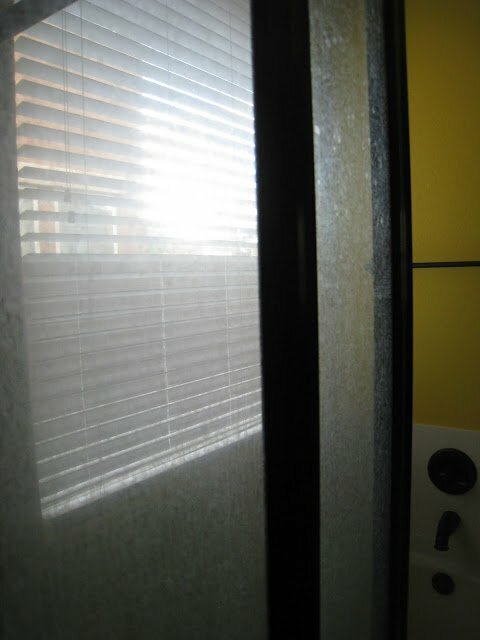 Many people, when asked, would define soap scum as that irritating, cloudy residue on their tub or shower door! Soap scum is a white build-up consisting of minerals from the water, dirt, bacteria, and sloughed-off skin. 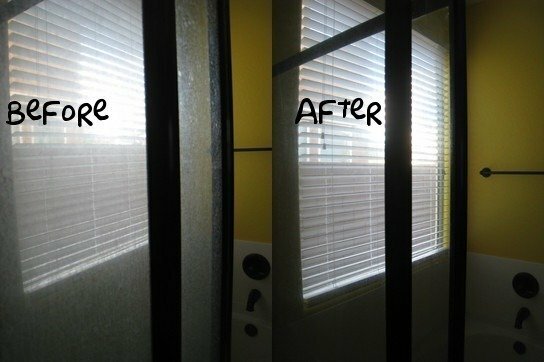 The very best way to keep soap scum off glass shower doors is to prevent it from happening in the first place by wiping the glass completely dry after every shower. Obviously not me (wink). 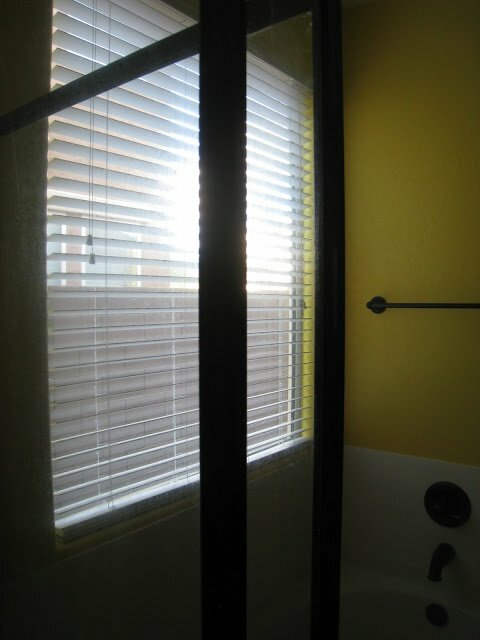 The photo above is a picture of my glass shower door just prior to cleaning. Soap scum forms quickly in my shower due to the extremely hard water that comes from the tap. But thankfully, there are several ways to get rid of it. In a spray bottle, combine a mixture of 2 parts white vinegar and 1 part water. Leave spray bottle in the shower and spray on the glass after every use. Combine the ingredients in a spray bottle. Spray mixture on glass and allow to penetrate. Follow with a sponge or brush. Directions: Add liquid castile soap to baking soda slowly until paste is formed. Then proceed to add tea tree oil and optional antiseptic essential oils. Apply scrub to sponge for use on shower doors. Allow paste to stay on glass for 5-10 minutes. Spray with vinegar and wipe off with sponge. Rinse off and then dry. The results of these cleaning methods really are remarkable. See the difference for yourself! -The best time to clean soap scum is right after taking a warm shower. The heat and steam aid in loosening the scum and allow a bit more ease when scrubbing. -Tea tree oil is a natural fungicide and carries many antiseptic properties. Tea tree oil will kill most of the bacteria found in the soap scum and help prevent growth. -Dislike the smell of vinegar…fear not! The vinegar smell will fade within a few hours of cleaning. -I like to purchase essential oils from Mountain Rose Herbs. What Compels Us to Make Things at Home? Thanks for the recipe! I'll have to give it a try. I made up some of the heavy duty scrub. I used it to scrub my showers and toilets. I had some leftover so I used it to clean my stove and refrigerator. I still had more leftover so I scrubbed my kitchen sink and counters. I was really impressed with it when it got out some tough stains in my sink. I had been trying for "years" to get these stains out with all kinds of different cleaners. My husband came home and noticed how shiney my kitchen sink was and he was impressed with how great this simple cleaner worked. This cleaner is definitely a keeper. Thanks for sharing it. Ooh I am so going to try this! Thanks so much. We have an older home and no matter how hard I try I can not get the toilet in the master bath all the way clean. It drives me batty. I took a pumice stone to it yesterday and got the majority gone. It is like the finish is worn or something. I will try this and see how it works. It has to stay for now because we are saving to remodel the bathroom so I do what I can. I think I'm going to love this… as soon as I get some Tea tree oil, I'm on it! again, bookmarking! I love your "recipes"
Do you have anything for oil face cleansers? I made my own using olive oil, vitamin E , and a teeny tiny amount of tee tree oil cleanser. Wonder if you had something ? Thanks for the recipe! Going to look into trying it! How timely as I just got done cleaning the shower stall…a job I despise!! I bookmarked this for future reference…thanks! I can't wait to try this! Thanks for sharing this post with the Gallery of Favorites. 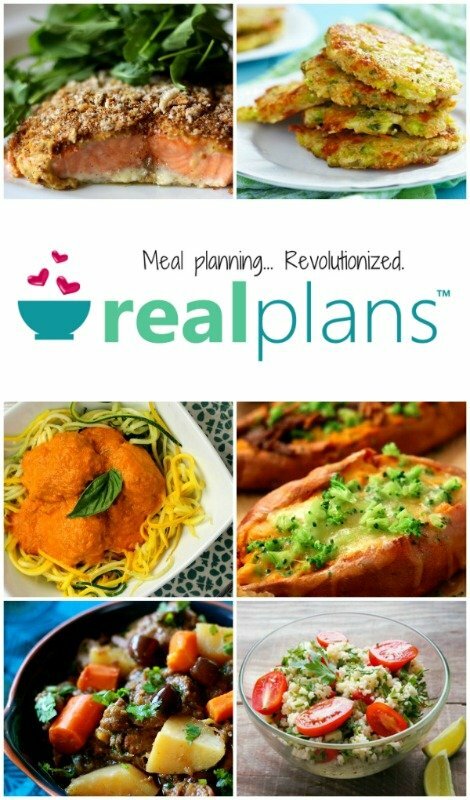 Thank you for all the info and recipes! Since I started making and using home made soap, I realize that it leaves quite the scum trail… this will be useful. Thank you for sharing these great natural cleaning recipes with the Gallery of Favorites! I usually get rid of soap scum by just scrubbing with straight Borax and a wet sponge. This is a great recipe! OR you could just use a magic eraser. The magic eraser cleans tubs and shower doors with soo much ease! Do you know of any way to not use tea tree oil? My husband is allergic to it. In place of tea tree you can use grapefruit seed extract. I purchased mine from Mountain Rose Herbs. I tried this with AMAZING results. My husband was really impressed too. A little embarassing, but we thought we had a “frosted” glass shower door. Nope. All the other products had just left a thick film behind. I used the heavy duty scrub and really didn’t even scrub…more wiped and rinsed. Sparkling clear. Wow. 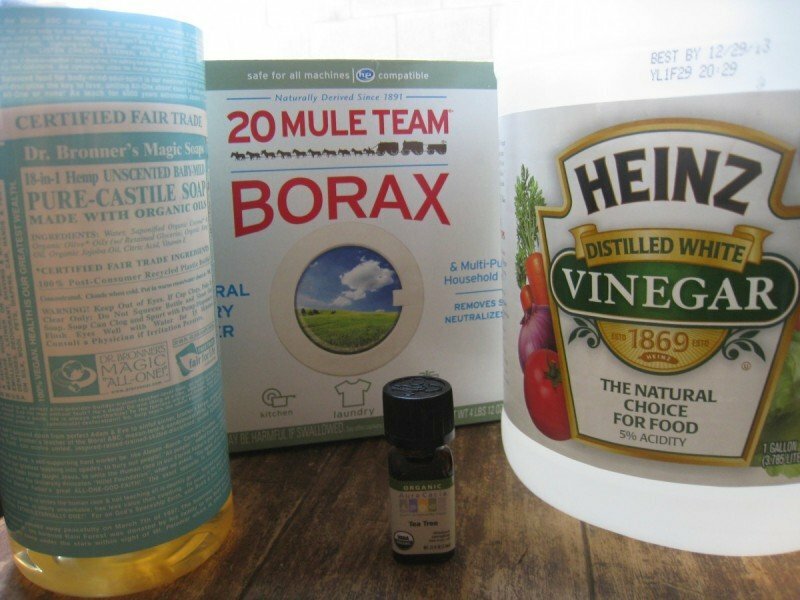 Borax is great for getting rid of bugs. And it’s cheap. Use a pop bottle cap. mix honey, syrup or some other sweet liquid, 4 parts to 1 borax, and change it every other day until you don’t see any more bugs. Worked for me getting rid of ants. The preventative mixture is similar to a recipe I used to use in my kitchen last year (I only use it in the bathroom now since I learned you shouldn’t use borax around food — now in the kitchen I use 1:1 vinegar and water). I love the soft scrub recipe as well. A few weeks ago, I was on a mission to get rid of the soap scum in my shower. My husband and I live at my parents-in-law’s house (I’m 23) for the moment, and I insisted on cleaning the bathroom and toilet we use, although sometimes my mother-in-law cleans them. I used the soft scrub recipe a few times a week (when the scum got bad). One day my mother in law came in and said, “did you clean the shower?” and I said “oh yeah a few days ago,” and she was like “what did you use!? it looks so white!” and I told her, and I think she was pretty impressed because she usually uses Viva shower clean wipes that are EXPENSIVE and have a lot of chemicals in them. Then she said, “ok you can have that job now. it looks so good!” haha aww. I make up a lot of the soft scrub right before I use it, then I clean the toilet with it too. I’ve also started to use 1:2 hydrogen peroxide and water to get it looking newer. I just spray it on once a week and let it dry. Some advice on tea tree oil: I live in Australia which makes it easy and relatively inexpensive to get (it’s native to Australia). But sometimes I use it and sometimes I don’t. You could choose to leave it out and achieve the same results; it’s just good as a mild antiseptic — good for the toilet. (and skin problems) I generally try to avoid disinfecting anything except the toilet (and sometimes the shower). The vinegar and borax in the recipe will kill your mold, so tea tree oil is, in my opinion, not necessary, especially if you don’t already have it. Removing soap scum from my bathroom’s tile and grout, and especially from the bathtub has always been true hell for me. Moreover, it can easily attract mold! And I have to be honest I never tried using vinegar before, but I heard it works. Will definitely try it next time. Removing soap scum from my bathroom’s tiles and grout, and especially from the bathtub has always been true hell for me. Moreover, it can easily attract mold! And I have to be honest I never tried using vinegar before, but I heard it works. Will definitely try it next time. It’s a big deal, but knowledge is power, so I wanted to share with you!! Here is the quoted link. Apparently, it IS a big deal. Just a heads up everyone!! Wow, wow, wow!! I had some serious soap scum in my shower. I am very allergic to almost all household cleaners, so it was not a pleasant chore to clean the bathroom knowing it would make me very sick. I was able to use Bartender’s Friend ok, so I tried it in my shower. It made a horrible mess!! It just smeared the scum around and made it dark. I was about to panic, so I looked on the web for a natural way to clean the scum. THANK YOU SO SO MUCH for this page!!! I used the heavy duty recipe, substituting Dawn dish soap for the castile only because I didn’t have any castile soap on hand. It worked a blessed miracle on my shower!! I don’t think it has been this clean since I moved into this house. And it didn’t take a ton of elbow grease to get it super clean. I was so excited that I cleaned every surface in my bathroom and my kitchen with the concoction. Again, WOW! It works and how! I will send this page to all my friends. Being eco-conscious, I am so happy to have found this. Do you have any natural remedies for shower mold that gets into the tile/grout? Ive tried a few things and scrubbing but need something more effective. Finally tried this tonight after about a month of re-reading the recipe trying to decide if it was worth trying. We put in a glass shower 2 years ago and have found thick soap scum on the bottom 12” of the glass ever since. We even dry the glass each time we are done…but it never kept the soap scum away. I used all kinds of waxes and cleaners that the glass company suggested but nothing really worked very well. I hated using the chemical based cleaners inside the enclosed glass shower…and it stunk up the whole end of the house for hours. This recipe WORKED! I walked into the bathroom at 930 and sprayed, wiped with a sponge, dried with a rag and voila! Clean! The worst areas of build up I went back and sprayed/soaked a few more times to get the scum to come off. It looks great…bathroom smells great and my skin is super soft and smells good too! I followed the recipe as it is except I subbed Dawn for Castile…forgot to buy Castile today. Amazing stuff!! I used it to clean my toilet and glass shower door. I actually love the smell unlike the chemical stuff you buy from the store – that always gives me a headache! I have left overs so I’m going to try it on my bathroom tile floor. I’m sure it’ll turn out great! Thanks for the recipe! I am really happy to find a natural cleaning solution for the awful soap scum! I find it really irritating, indeed! Thanks for the recipe!